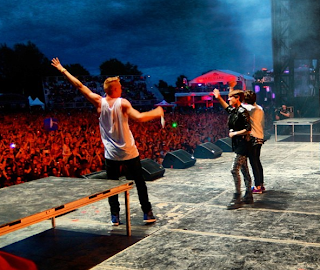 Tonight at Osheaga the crowd got a nice surprise during Macklemore and Ryan Lewis' set. Tegan and Sara join the duo on stage during the song Same Love to sing the part originally sung by Mary Lambert. If you didn't get teary when you heard that song to being with, having the Canadian duo join the Mack was amazing. A. Maze. Ing. This is a highlight of the festival - for sure.